Dominic Sena’s aesthetic hasn’t changed much over the years, but his budgets apparently have. Sena previously worked from the deep pockets of Jerry Bruckheimer (with Gone In 60 Seconds) and Joel Silver (on Swordfish and Whiteout), but Season Of The Witch, with its portrait-studio-worthy backdrops and painfully obvious soundstage sequences, looks like a remarkable comedown. Sena still goes for the kind of flashy effects and slick action that excited him in the past, but with budget-friendly squibs instead of explosives. The film looks dispiritingly cheap and, as if in response, most of his cast seems half-committed at best, as if they’re counting the moments until they can move on to a bigger picture. That’s especially disappointing when it comes to Nicolas Cage, whose over-the-top scenery-chewing is often the high point of his lowbrow films. 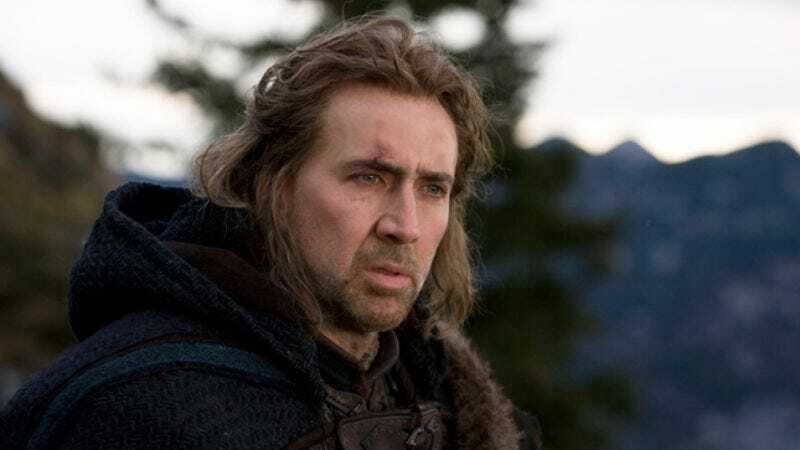 Apparently the scenery in Season Of The Witch looked as flavorless to him as it looks to the camera; Cage plods through the story with a stiffly restrained, exaggeratedly earnest performance that makes him look like the most awkward amateur in the local Society For Creative Anachronism troupe. (It’s hard to blame him, when he has to mouth lines like “I have no such yearnings for home!”) He and Ron Perlman (whose easygoing take on the material is far more convincing) play 14th-century knights who desert their war band after a ridiculous many-year battle montage leads to a dispiriting massacre of women and children. Disillusioned with the Church, they’re nonetheless dragooned into helping a priest transport a suspected plague-causing witch (Claire Foy) to a remote abbey. There, a magical monkish book of rituals might reverse her evil magic, which is supposedly turning people into grotesque piles of goo. Briefly, the film plays with the question of her guilt and her true nature—is it possible she’s just a scapegoat for self-righteous, superstitious men? But ambiguity isn’t Sena’s strong point, and he and screenwriter Bragi Schut would rather focus on awkwardly staged action, like the party’s irritatingly lengthy attempt to cross a broken-down bridge over a yawning abyss. For much of the film, Sena seems unsure whether he’s making a CGI-assisted fantasy-horror in Van Helsing mode, or a grim Middle Ages mystery à la The Name Of The Rose. The former, given Cage’s presence, might have made for some overripe entertainment, but would have required more money. Unfortunately, the film’s preposterously self-important yet faintly cheesy tone can’t support the latter. Season Of The Witch was originally scheduled for a March 2010 release before being delayed and dumped in the January graveyard, but it probably shouldn’t have been released at all. No use throwing good money after bad, even if there wasn’t much invested to begin with.